Here’s the list of records Ranbir Kapoor’s Sanju teaser has made within days of release! The film sheds light on some untouched aspects of superstar Sanjay Dutt’s eventful life. Exceeding all expectations, the teaser of acclaimed filmmaker Rajkumar Hirani’s upcoming film Sanju clocked over 150 million views all around the world, becoming the widest viewed teaser ever. Soon after its release, it turned out to be an instant viral hit amongst the netizens with over 2 lakh searches on Google in 24 hours. The film features Ranbir Kapoor as Bollywood star Sanjay Dutt. Following are some of the records the Sanju teaser has made within no time. The recently released teaser has created a rage online as it not only became the most viewed teaser with 30 Million views on YouTube in less than 48 hours but also emerged as the most searched, most talked about and the craziest teaser of all time. Within no time, the teaser and poster spread like wildfire on the internet making it the most watched teaser and the newest meme fodder for netizens. The teaser became the most trending video on YouTube garnered over 30 Million views in less than 48 hours. The teaser was not only the most trending on Google and Facebook but also Twitter was flooded with memes and compliments appreciating Ranbir Kapoor and director Rajkumar Hirani. The teaser has been the most trending video on YouTube not just in India but also created a stir across the globe. 'Sanju' has been trending on #1 in India, Pakistan, Nepal, and Bahrain, #2 in Australia and Canada, #3 in the US, #8 in Germany and #27 in Germany. One of the most anticipated films of the year, 'Sanju' has taken the audience by surprise with Ranbir Kapoor's striking resemblance to Sanjay Dutt. The teaser has further elevated the interests of the audience making for the most talked about topic on the internet currently. Written and directed by Rajkumar Hirani, the film stars an ensemble cast in addition to Ranbir Kapoor which includes Anushka Sharma, Paresh Rawal, Sonam Kapoor, Dia Mirza, Karishma Tanna, Manisha Koirala, Jim Sarbh, Vicky Kaushal and Boman Irani in pivotal roles. Produced by Vinod Chopra Films and Rajkumar Hirani Films in association with Fox Star Studios, 'Sanju' is all set to be released on 29th June 2018. Eros International buys Salman Khan’s Race 3 for a whopping Rs.190 crore? 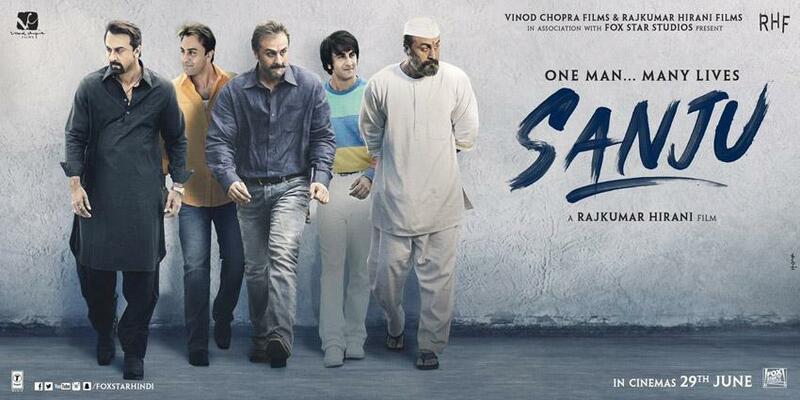 Sanju Poster 3: Ranbir Kapoor perfectly dons Sanjay Dutt’s look as he walks out of jail! John Abraham presents the official teaser of Parmanu: The Story Of Pokhran! John Abraham and KriArj Entertainment came together to reveal the latest Poster of Parmanu!